Dear Mr.Jeff Williams, I’m an italian fan of Nasa. My english isn’t very well but I hope to explain my big admiration for your missions in the space. I would like to go in the space for see our wonderfull earth from the deep sky. Is it as exciting to be in space as us would – be, (dreamed of being) astronauts have imagined? Do you see many odd shaped things swimming or floating passed the windows? What do feel inside, that is different than standing on the groud? -C.
Good luck! And remember, getting there is half the fun. And coming back is easy, all you have to do is fall. All the Best Sir. Happy Journey. Looking forward to following your adventures on this blog and Twitter. Enjoyed watching your last flight on Expedition 13 with Pavel on NASA TV. Hope you take just as many great photos this time! Have a safe flight and successful mission. I will be an avid reader of your posts, even if I never comment on them. Thanks for inviting us along! Looking forward to Expedition 21/22! I’m very interesting about NASA. I want to come visit. I am looking forward to reading about your experiences aboard the ISS. I toured a full size replica of the ISS many years ago when NASA was building public support of the program. It is amazing what can be accomplished with determination and team work. Excellent work Jeff,should be fun for all of us.Hope for the very best! great jeff! my 3 1/2 year old son and i are excited to follow along. we have been enjoying watching the nasa channel and all of the amazing footage of life on the iss, so it will be great to hear about all that goes into preparing for that! Awesome! This initiative is really a must for Space Enthusiasts. More so for me, being able to witness a person I have had the pleasure to work with going to Space to be the Commander of a Space Station. I hope you remember me (I was your translator while you were in Brazil in the last 3 days of your trip) and I hope to be able to follow your journey from now on. To the infinite and beyond! 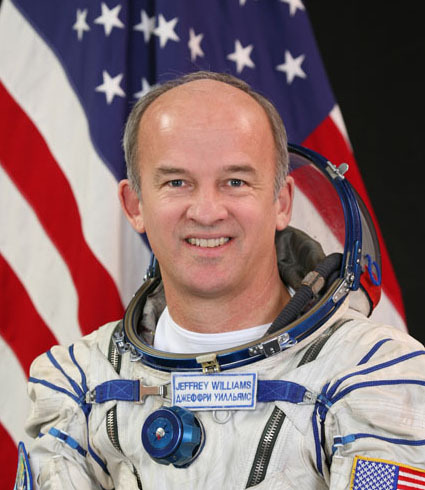 Congratulations to dear Jeff Williams for his tremendous dedication to space exploration and different missions aboard the ISS. I had the great honor and pleasure to meet him in Brasilia, Brazil, where I live, through our Brazilian astronaut Marcos Pontes, when they came here some time ago, together with cosmonaut Vinogradov( hope this is well spelled…) I am very involved with space stuff, specially since I started presiding the National Space Society here. SPACE IS OUR REAL PLACE, JEFF! Hugs and GOD SPEED!!! Hello Jeff and greetings from Park Falls WI. We will be listening from here hoping to catch you on the amateur radio in the ISS. Maybe we could set up an informal sched sometime? Hello and a huge thank you for this opportunity! It is exciting that we(our students included) will be able to see how your mission is going on a first hand basis. Just found out about your next flight. Our prayers will be with you and Ann-Marie both. I would like to know if there was a earthbound object headed for earth from outer space, when you ( in the spacestation)see it how long would it take before it would hit the earth and when would it be reported to us that it is coming toward us???? It has been prodicted that a astrod will distroy the earth in 2012 what is your oppinion on this?